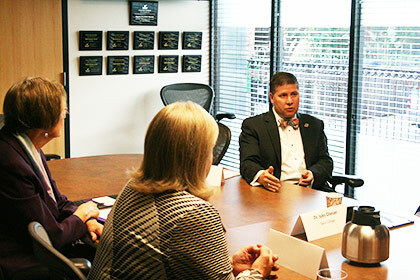 Cowley College president Dr. Dennis C. Rittle was among a panel of experts discussing the opportunities and challenges facing education during an Education Roundtable held Thursday, September 15 at the Wichita Business Journal. Along with Dr. Rittle, other panelists were former Cowley College Dean of Student Learning Pam Doyle, who is now the Chief Academic Officer of General Education and Health Sciences at Wichita Area Technical College; Sue Maes, Dean of Kansas State University Global Campus; and Dr. Jules Glanzer, President of Tabor College. Bill Roy, Editor of the Wichita Business Journal, served as the moderator during the discussion. The education leaders spoke of the impacts of their institutions and how their schools impact their areas of the state. Dr. Rittle spoke on this topic from the comprehensive two-year college viewpoint. The education leaders also spoke about their institutional partnerships in the community and with other institutions, as well as the transformational things that are happening within their schools. Dr. Rittle mentioned three unique partnerships which Cowley has recently forged. First, Cowley’s Tiger-2-Tiger Pathways partnership with Fort Hays State University guarantees a minimum number of scholarships will be awarded annually for eligible Cowley College graduates transferring to Fort Hays State University upon completion of their Associate degree. Second, Cowley’s partnership with local high schools. Cowley College is the only college in Kansas or Oklahoma entrusted by the US Government to award Federal Pell Grant dollars to qualified High School Students taking dual enrollment coursework at Cowley College while attending high school for the purposes of increasing access to higher education, reducing time to completion, reducing student debt. Last Cowley’s Milling program partnership with Kansas State University is the only one of its kind in the nation and is an industry-based partnership developed in close relationship with the International Association of Operative Millers. “Education is the best investment a person can make in his or her life,” Dr. Rittle said. The panelists finished by discussing how their institutions contribute to the betterment of society. 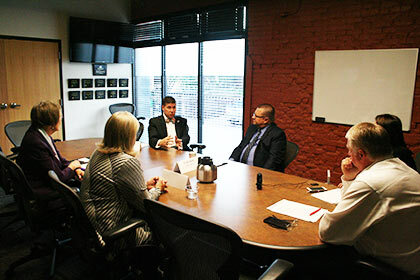 A full article on the Education Roundtable will appear in the Friday, September 30 issue of the Wichita Business Journal.